The functional interactions of two genes can be predicted by their conserved proximity in the genomes of distant species. The observation can be used to build large scale networks for bacterial species e.g. in the STRING database but there is little evidence for such conservation in larger eukaryotic species such as animals. Metazoan gene order is scrambled after short periods of evolutionary time and few interactions can be found except for the conserved Hox gene clusters. Gene-gene pairs in metazoan genomes. Irimia et al. now show the prediction of 600 gene-gene interactions in human and more in other species by analysis of conservation across 17 metazoan genomes and demonstrate the validity by a variety of large scale experiments. In brief, some gene-gene-pairs are more conserved than expected, suggesting a functional relationship. 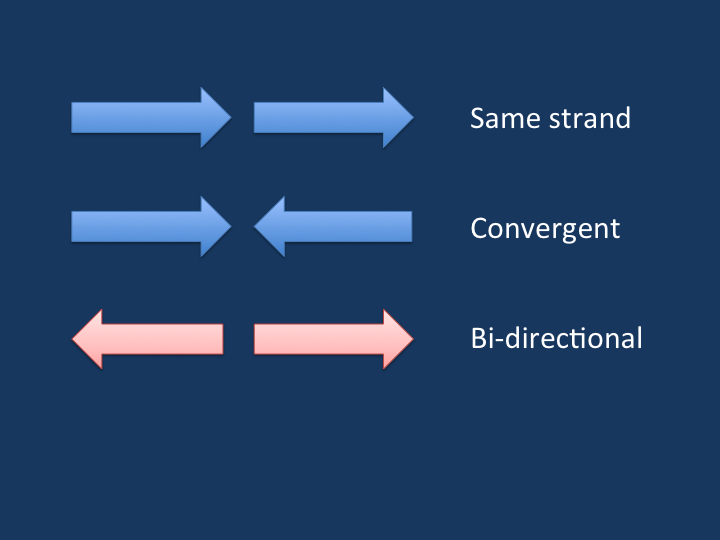 Not all gene pairs are adjacent – longer range interactions are also studied. It’s funny to read such a seemingly simple analysis in 2012 as so many people will have tried similar lines of research after the observations by Abachi and Lieber about bidirectional promoters, i.e. promotors, which affect gene expression in the upstream and downstream direction. The small number of available metazoan genomes might have been a cause for the late discovery. Or am I expecting science to move too fast? Adachi and Lieber found that bi-directional gene pairs are conserved in higher eukaryotes and suggest the accepted explanation that a single promoter drives the expression of both genes. Location, location, location. The number of new interactions identified by Irimia et al. is small but the experimental data lined up supposedly point towards high degree of true positives. The identified genes might not be of direct interest to epilepsy genetics as they are primarily found it basic cellular functions. But the observation that conservation is strong on a few gene pairs hopefully allows a glimpse on what shapes the genetic architecture, suggesting other neighbouring genes in humans might have positional effects. A recent publication by Campbell et al. provides an interesting example for epilepsy research and suggests cis-regulatory effects between epilepsy genes at the chromosomal region 9q34 including STXBP1 and SPTAN1. I wonder what role non-coding RNAs play in the cases presented by Irimia et al., which is not touched upon.